Have you ever wondered how the United Methodist Church develops it rules and guidelines for organization? That governing and legislative body is the General Conference which meets once every four years. The 2016 General Conference of the United Methodist Church meets May 10 – 20 in Portland, OR, in the Oregon Convention Center, the largest convention center in the Pacific Northwest. The theme will be “Therefore Go,” which is based on Jesus’ Great Commission in Matthew. As the top policy-making body of the international United Methodist Church, General Conference is the only body that officially speaks for our 7.3 million members (and additional 5.5 million residing outside the U.S.). We have 32,000 active churches and 57 Annual Conferences. The General Conference is the top policy-making body of The United Methodist Church which meets once every four years. The conference can revise church law, as well as adopt resolutions on current moral, social, public policy and economic issues. It also approves plans and budgets for church-wide programs. During the nine-day session, 850 delegates revise the current Book of Discipline, which regulates the manner in which local churches, annual conferences and general agencies are organized. The book also sets policies regarding church membership, ordination, administration, property and judicial procedures. At the end of General Conference, the 2016 Book of Discipline will be generated and published later in the year. Delegates may not revoke or change the Articles of Religion or the Confession of Faith unless two-thirds of the delegates agree to change this provision and three-fourths of the annual conference members also agree. A number of United Methodists have denounced the 2012 gathering as the “do-nothing” General Conference. 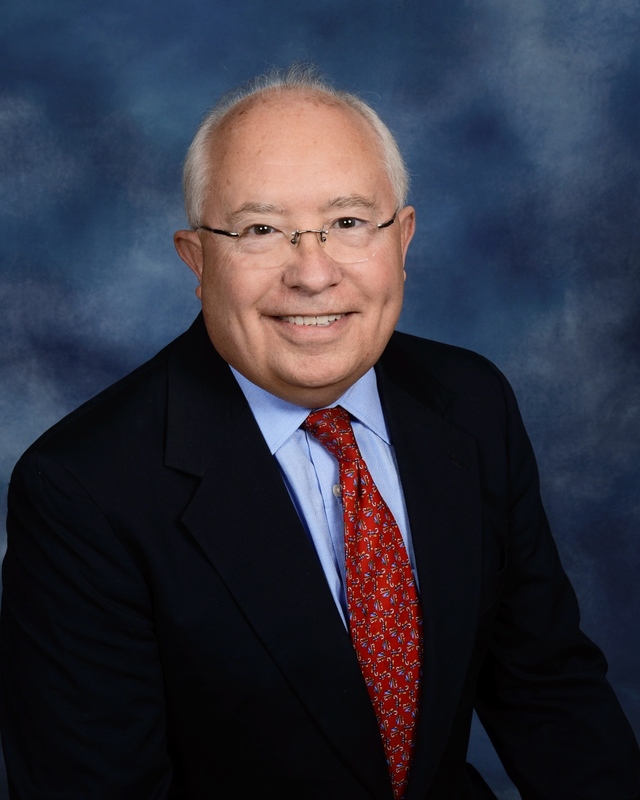 The Judicial Council — the denomination’s top court —overturned an effort to restructure the church’s general agencies and overturned other legislation to eliminate guaranteed security of appointments for ordained elders in good standing. The wider General Conference ran out of time before it could consider a number of petitions approved by legislative committees. With a 15% decrease the number of delegates attending General Conference, the hope is that the delegates will work with increased efficiency. 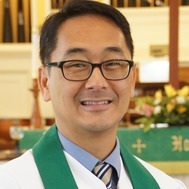 The People of The United Methodist Church and Trinity Church are being asked to: Help people in their community; accept others for who they are; offer a place to belong; care for and support each other; show respect for other religions; support people facing difficult times; welcome diverse opinions and beliefs; and, guide others to find deeper meaning and relationship with Jesus Christ. All the missions and ministry areas of Trinity Church are doing this. AMEN. John Wesley was the reluctant founder of our United Methodist Church. I say he was the reluctant founder because he was clergy in the Church of England; what he really wanted was to seek change in that Church. Instead, he brought about a movement of believers who lived out God’s grace and social justice in a way that was very different from that of the Anglicans. Be devoted to prayer. Wesley called prayer the “grand means of drawing near to God” and he modeled that by devoting at least two hours a day to prayer. Wesley knew that prayer deepens our connection with God. You don’t have to dedicate two hours a day to prayer, but why not try setting aside some time to talk with God when you wake and just before bed. You don’t know how to start the conversation? Ask Jim, Keith or me. Give the Ministry to the Laity. As Wesley’s early ministry quickly grew, he took the advice of his mother (smart guy!) and enlisted laity to help lead the church. Some were called to lead small groups, others even preached in large groups. Wesley used both men and women to be lay leaders of his church gatherings. Use Mass Communication to Get the Word Out. Wesley missed owning a Mac by about 250 years. His mass communication tool was the printing press. He wrote and published many sermons, tracts and books. Today, we have phones, tablets, laptops and desktops to keep us tapped into all forms of social media. This provides us unlimited opportunities to spread messages of grace, peace and kindness. How our world would be different if everyone’s posts were designed to build up instead of break down; to inspire instead of insult. John Wesley’s ideas were sound and scripture-based. They are as timely and relevant today as they were when he shared them with the believers of his day. I pray that Trinity United Methodist church will continue to grow, flourishing as we become the place God has planned for us. My question to us as parents and educators is: how can we enjoy and celebrate the ordinary times of our lives and teach that to children? I raise this question because if we have exciting programs for children’s ministry, attendance will increase. Therefore, I planned on inviting magic acts, puppet shows and music bands. The big problem is that most of them were already invited by local preschools and day care centers that your children attend. Moreover, I began to realize the extraordinary happens every week in our classrooms. From time to time, I am asked to come into class to help or observe. The class talks about the story that was read or works on crafts, or eats snack. The way teachers interact with students, and the way students are engaged in putting together craft projects, are all seemingly ordinary. But to me they are extraordinary in that care and love are demonstrated. I cannot really put my finger on it but after class I walk out with joy in my heart and a spring in my step. I’m so grateful for our extraordinary teachers and students who transform class time into something special every week! In For One More Day, Mitch Albom writes, “You can find something truly important in an ordinary minute.” Let’s teach our children and ourselves to celebrate our seemingly ordinary moments. In Christ we are already extraordinary and beloved! If you’d like to try out Trinity’s book club before it breaks for the summer, please join us in the Library on Tuesday, May 10, at 6:30 p.m. to discuss a classic: The Secret Garden, by Frances Hodgson Burnett. We pick up again in September, and if there’s enough interest, a daytime session may be added. To express your opinion about this or to suggest books for consideration, please contact Kathy Maher at Kathyngs@gmail.com. 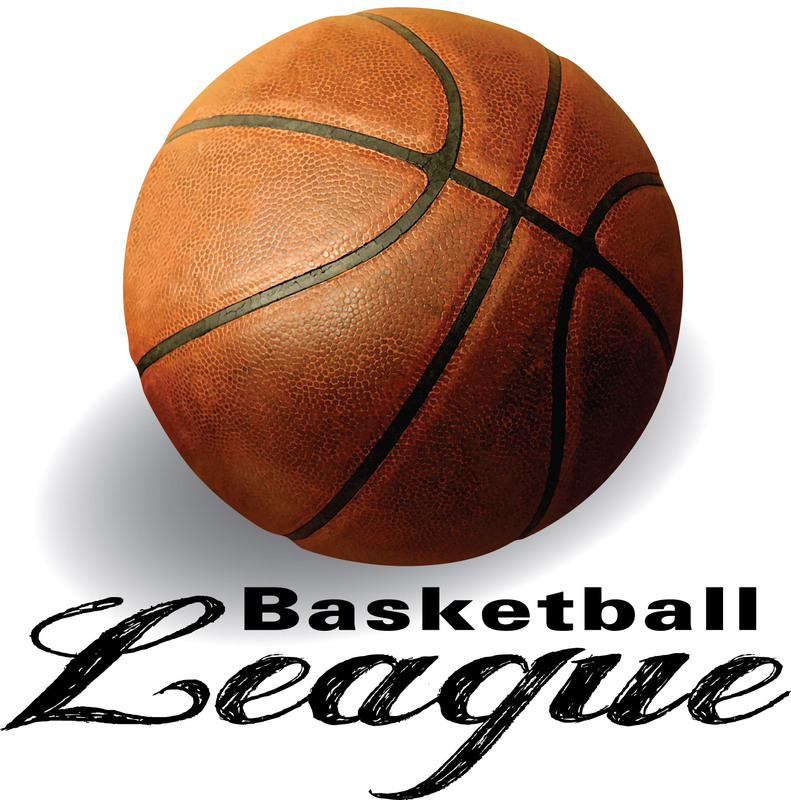 A few McLean churches are looking to form a church basketball league for Fall and Winter 2016. Interested players (male and female, ages 19 –99) are welcome to attend the meeting and learn more about the process. Trinity needs enough players to form a team and at least one team captain to liason with the league, manage communications with players and to provide Harriet with bulletin/newsletter announcements. If you want to be apart of a team for Trinity or if you want more information about the proposed league, please contact Harriet Latta. On Sunday, June 12 and in the June Spire we will recognize the Class of 2016. 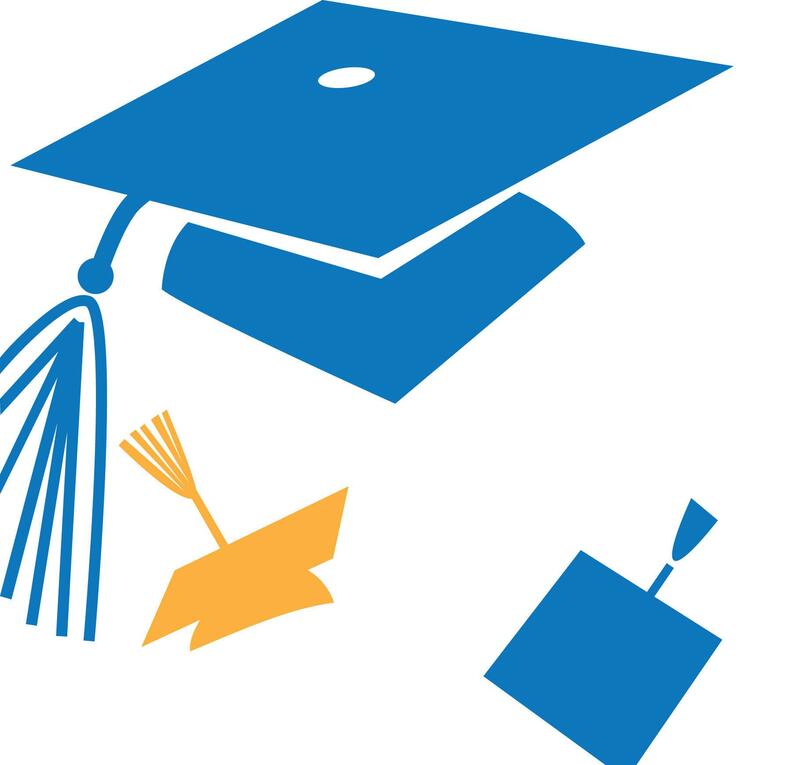 Please send the names of your high school or college graduates to Harriet Latta by May 15 to be listed. 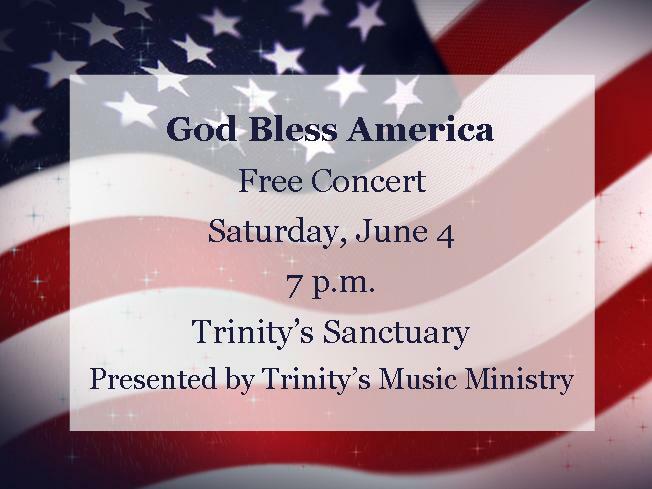 Featuring: Soloists Philip Keirstead, Michelle Kelly, Doris Page, Catherine Wethington, Nadine Wethington, Joey Wilson and Michelle Zenk will be joined by the Chancel Choir and Trinity Ringers, all under the direction of Music Director Jerry Rich. The theme is “God Bless America”; in addition to an audience sing-along of Irving Berlin’s beloved song, selections will include Charles Ives’ The Circus Band, Sherman Edwards’ The Egg from 1776, Margaret Bonds’ setting of He’s Got the Whole World in His Hands, Sammy Fain’s I’ll Be Seeing You, Betty Garee’s Materna, Mark Hayes’ Old Time Religion Medley, Scott Joplin’s Peacherine Rag, Hart Morris’ Simple Gifts, and Sigmund Romberg’s Will You Remember from Maytime. Admission is free. To volunteer, contact Jen Calsyn. Registration forms are available in Sunday School classrooms, in the Narthex, and on the church website. This month we will collect diapers, wipes, baby food, and formula for Facets. Facets provides services to prevent and end homelessness, provides hot meals for hungry families, has hypothermia prevention services, and works to find housing for those in need. Many of these families have babies. Let’s help Facets help the needy by providing these much needed baby items! Your donations can be placed in the baskets located in the church narthex entryways or in the bin in the Fellowship Lobby. Thanks to all who donated supplies for the Falls Church-McLean Children’s Center! Also, a big thanks to everyone who came out for the Good Works Day on April 30! Crafts for a Cause will meet THREE times during May to work on comfort items for local hospitals and shelters, so mark your calendars now! 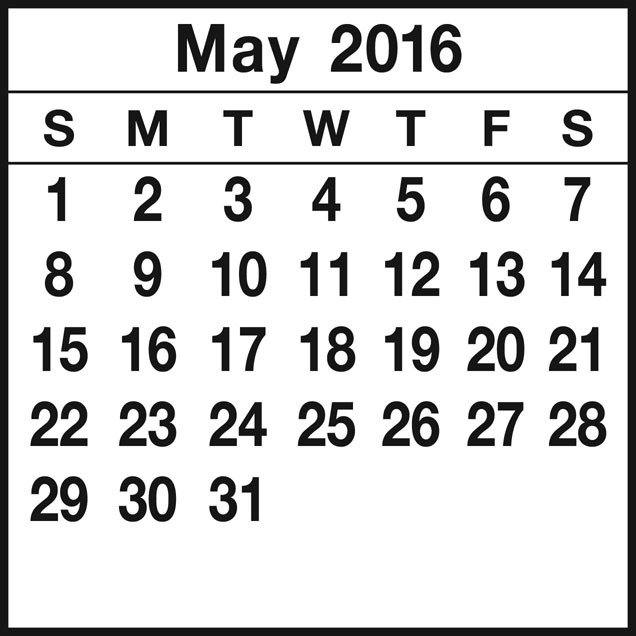 We will meet Wed., May 4 from 10 to 11:30 a.m. to finish up the projects started on Good Works Day. There will also be two Monday night sessions on May 9 and May 23 from 7 to 8:30 p.m. in Room 122. In June, we will meet on June 6 and June 20. After May 4, the Wednesday morning sessions will be put on hold for a while. If anyone is interested in meeting during the daytime, please contact Molly Sprouse so we can set that up. Meanwhile, the crafts group continues to work on the new project of making cotton dresses for needy girls. We sent about 50 to Heart to Heart in Honduras, and another 50 to an organization that distributes them to girls in Uganda. We are buying cotton fabric for the dresses, but if anyone has new or gently used cotton pillowcases in kid-friendly prints, we would be happy to receive those as well. Every month, Crafts commits to providing 20 neck pillows for chemotherapy patients at Fair Oaks Hospital, along with lap blankets, surgery dolls, sock dolls and the much-loved newborn baby caps (provided by Judy Osha and Nell Gilmore). Everyone is welcome to drop in on crafts at any of our meetings. No skills required; just a willing heart and hands. For more information, contact Molly Sprouse. Dan and Chris Moore are headed back to The Leadership Center in July and would be excited to have a team of up to six Trinity members join them. The Leadership Center educates poor, young women (typically ages 18-20) on a beautiful and remote mountain-top campus about two hours from Tegucigalpa, the capital of Honduras. The school is home to about 30 young women who learn and live in community together. Curriculum and hands-on training is provided over 10 calendar quarters in English, leadership, community development and entrepreneurship. As a mission team we will have the opportunity to both share and gain knowledge in fields as diverse as teaching English as a second language, teaching leadership, seminars in women’s studies, assisting entrepreneurs with business planning, helping with aquaponics, gardening, engineering, coffee production and organic farming. We will depart Northern Virginia on July 14 or 15 and return July 23 after 8 or 9 days. The cost of the trip will be about $1,100 to $1,300, including airfare, of which Trinity’s mission budget is able to provide $500 per Trinity member. We will be housed in a dorm type setting (bunk beds) with relatively rustic living conditions. The food is wonderfully authentic, the hiking to waterfalls is fantastic and the girls will warm your hearts! This will be a terrific cross-cultural experience that will absolutely change your life. Consider joining with friends or as a family and join us for a REAL mountain-top experience. If you are interested, please contact Dan or Chris Moore by May 15. 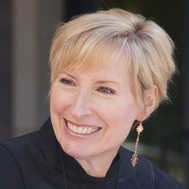 More information is available at: leadershipmissioninternational.org.